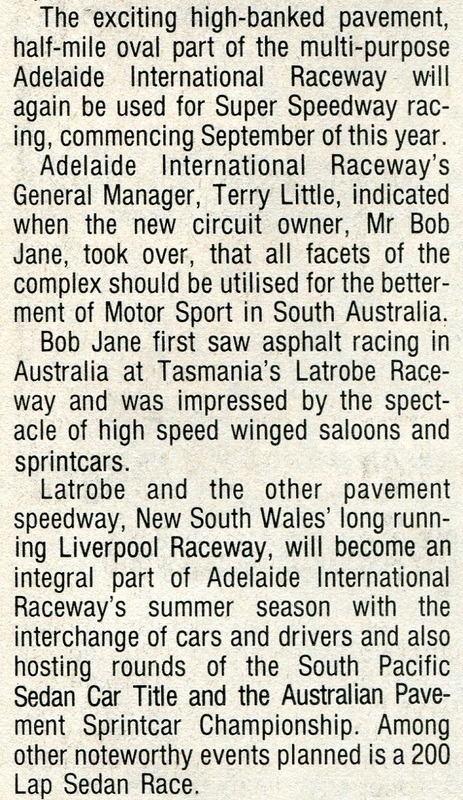 In the early 1970's paved short track speedway was becoming popular in Australia, It appeared to some that this type of racing would take over the already established dirt track speedway code that was already drawing large spectator numbers all over Australia on any given weekend, Other tracks in Australia that went sealed were Liverpool Speedway in Sydney and Tralee Speedway in Canberra. 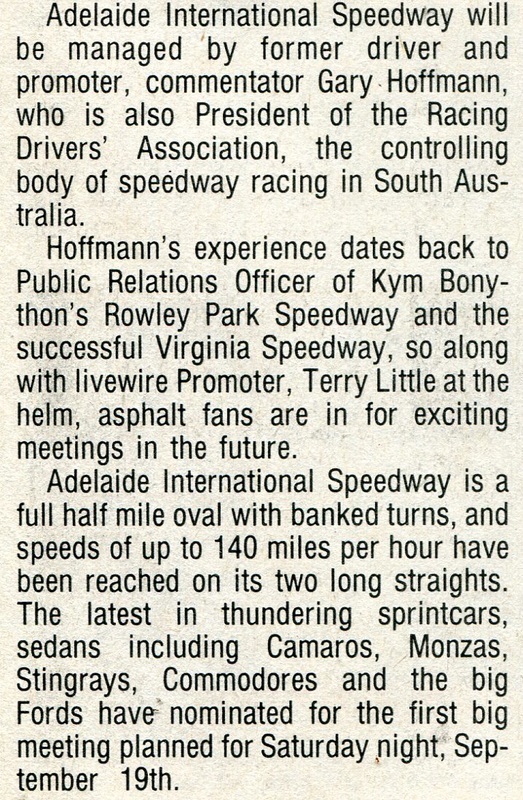 The Super Bowl was a 1/2 mile paved track banked to seven degrees, it was part of the overall complex that was refered to as the Adelaide International Raceway, This complex ﻿consisted of a Road race circuit that incorporated a drag strip on the main straight as well as the super speedway. 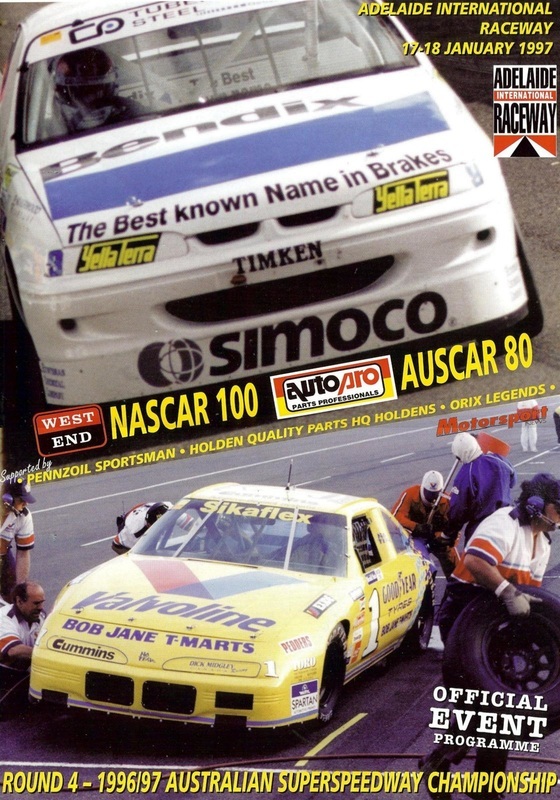 ﻿﻿﻿﻿Initially the cars raced were dirt track sedans and supermodifieds, but it was soon ﻿discovered that they were ill equipped for the pavement, Specific built cars soon started ﻿appearing with full space frame chassis, large slick tyres and bigger engines. With the need for these big dollar race cars to be competitive many drivers reverted back to the dirt tracks were the seasons budget didn't have to be so big. ﻿﻿By 1976 spectator numbers had dwindled to around 2,000 at any given meeting and competitor numbers had dropped as low as five or six cars per race, Speedway meetings ceased. 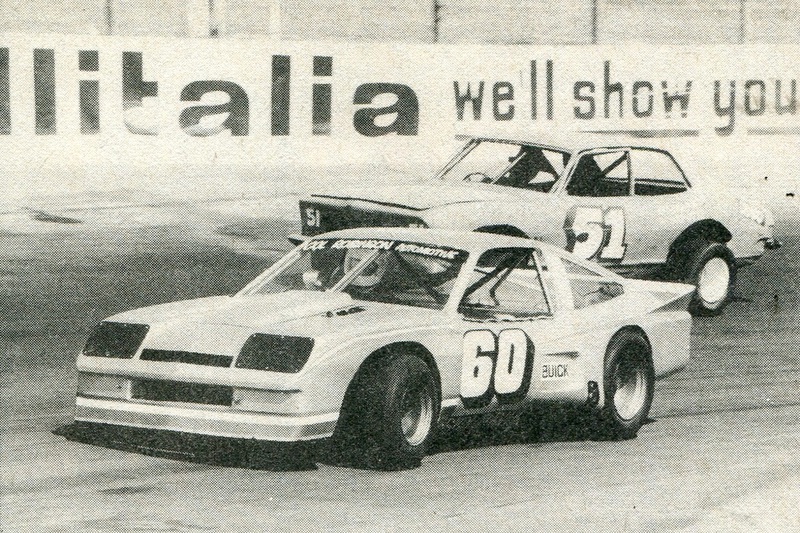 Speedway Super Sedans did return to the Super Bowl in the 1980's with some day meetings, however these meetings drew poor spectator numbers and once again this form of sedan car racing ceased.